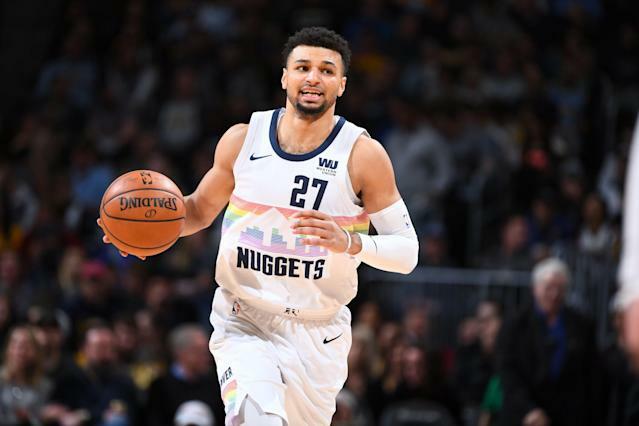 NEW YORK — Denver Nuggets guard Gary Harris walked over to teammate Jamal Murray’s locker with a smile, admiring his teammate’s sweater after an easy win over the New York Knicks’ last Friday. “Hey, I was gonna wear the same sweater tonight, too,” Harris joked. “Probably couldn’t tell us apart,” Murray replied. 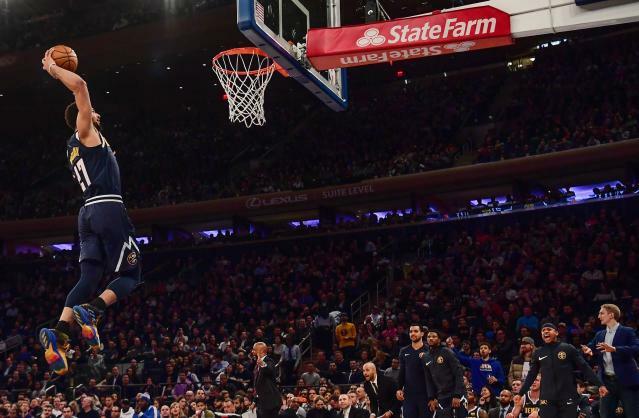 Chances are, the average NBA fan could have a hard time distinguishing the starting backcourt for the surprising Nuggets, who are battling the back-to-back defending champion Warriors for home-court advantage in the West. Neither is a star and in Denver’s deep rotation it’s hard to match a name with a face aside from all-world center Nikola Jokic. Those days, though, are coming to an end, and Murray is the one likely to garner more attention once the playoffs start and the focus starts to narrow. Stars are made in the postseason, and it’s hard to name another player who’s more underrated. Milwaukee’s Khris Middleton shined in last year’s playoffs and was rewarded with an All-Star appearance this year. Jrue Holiday is doing serious work in New Orleans, but the Pelicans are headed nowhere except for treacherous trade waters with Anthony Davis’ future in the air. There are others, of course, but it feels like Murray stands out because of Denver’s success this season and his lack of attention. Murray is the player who got under Russell Westbrook’s skin late in a Nuggets win this season, giving no quarter on a meaningless jump ball with 35 seconds left and the Nuggets leading by nine. OK, he also torched the Celtics for 48 points in November, drawing the ire of Kyrie Irving for daring to go for 50 as time expired and the Denver faithful nudging him on. Irving incredulously tossed the game ball in the stands, prompting conversations about basketball etiquette. “You go into work every day, you might piss people off, right? You're always gonna have haters, people who don't like what you do,” Murray said, shrugging off the notion he’s more of an irritant than performer. “I don't get under nobody's skin, man. I think that's [overplayed]. Everybody in the league has done something that somebody in the league doesn't like. I wouldn't call myself getting under people's skin. I like to hoop, I like to compete. Just being competitive is the word for me." He won’t apologize for his mindset, which has helped Denver foster an environment for success. The Nuggets have five guards capable of going off on a given night, with Monte Morris and Malik Beasley coming off the bench and Will Barton more than capable of sliding down to play guard when they go big. At 22, he’s the youngest of the guards and feels like he tones his game down for the greater good. Everything revolves around Jokic, as it should. His myriad skills lift all tides, and Murray has found a way to blend alongside him. Murray darts for openings away from the ball and other times he dances with it. Sometimes he merely takes the space you give him and throws up an off-balance floater. Next thing you know, he’s put up a quick 20, a feat he’s accomplished 24 times this year on the way to averaging 17.9 points, 4.2 rebounds and 4.8 assists. “You look ahead to every game, not be complacent, not overlook your opponent, be the killer that you are each and every game,” he said. The patience comes from practicing kung fu, which he says “is a whole different beast [than basketball], it’s being disciplined.” But his edge derives from growing up in Kitchener, Ontario, where he didn’t receive a lot of attention until the summer circuits in high school. “I was the overlooked kid. Always been the Canadian kid, perceived as soft, they always underrated us,” he said with a laugh. He took that mentality to Kentucky, where he was a third-team All-American before being the No. 7 overall pick for the Nuggets, two years after they selected Jokic in the second round. The Nuggets went about building a contender in plain sight but nobody knew. Murray became a full-time starter last season and opened some eyes, but the Nuggets missed the playoffs in their last game of the season, an overtime loss to Minnesota. They’ve left no doubt this go-round, and if the young Nuggets bother a few folks along the way, so be it. Especially the cankerous Westbrook, whom Murray says he admires. “I have nothing against Russ. I love his game, love how hard he plays. How he interacts with the fans, all of it,” Murray said. He's coming for you, even if you don't see him.